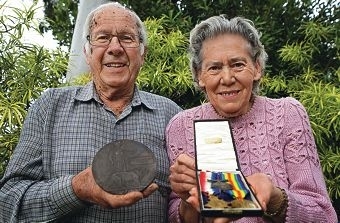 The Southern Gazette featured the sad story on its front page on July 16 after thieves ransacked Pamela and Ian Hollings’ home on Friday, July 5, stealing World War I medals and a Dead Man’s Penny that had been in their family for 97 years, as well as the couple’s birth and marriage certificates and Ian’s will. The war-time heirlooms belonged to Ian’s uncle Private William Craven Hollings, who served in the 32nd Australian Infantry Battalion and was killed in action aged 25 on the battlefields of France on July 19, 1916. After pleading to the thieves to return the irreplaceable items, Mrs Hollings last week discovered the medals and the penny in their letterbox. ‘I think someone’s conscience was pricked,’ Mrs Hollings said. Despite being overjoyed about having the items returned, Mrs Hollings said the robbery, which was the second time in four years their home was targeted by thieves, had left them uneasy. ‘We’re really wary of going out now,’ she said.